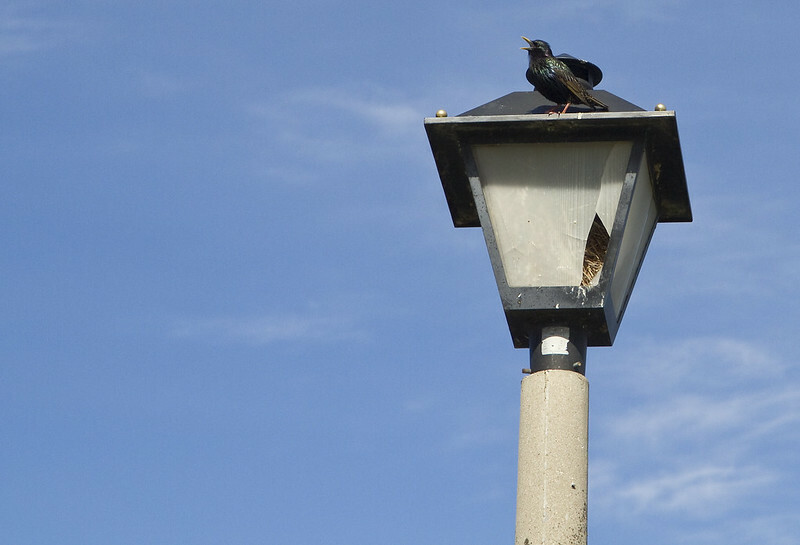 Come join me for a few sites from around town, taken on a sunny day or two in late April. Spring had just begun to emerge and so had the people. I hope you enjoy. One April morning, it appeared as if there was fire glowing outside of my window. 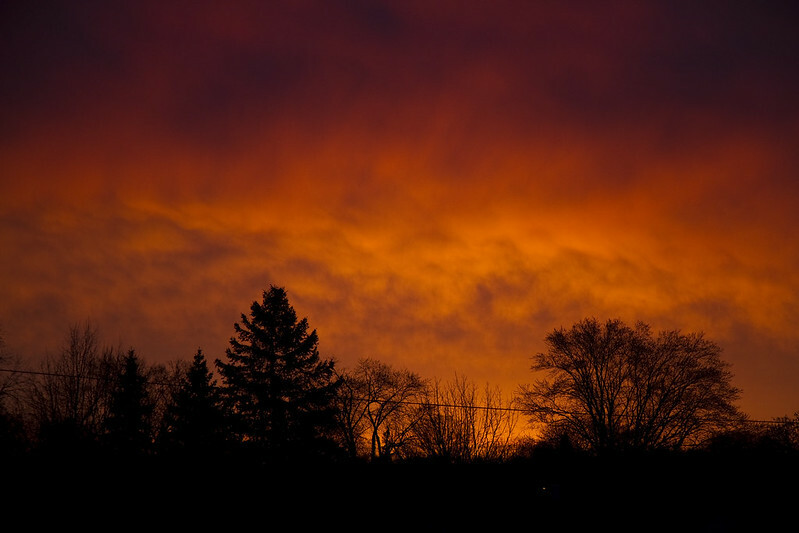 This stunning sunrise had the sky all ablaze. 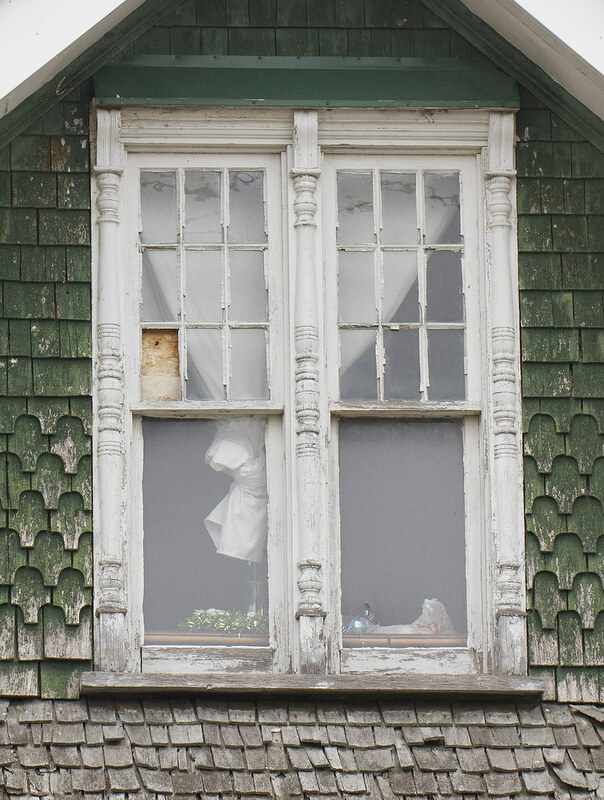 A bit of a worn down home, in close walking distance from my place caught my eye for the textures and collection of items in the upstairs window. There appeared to be some Christmas ornaments along with a boarded up glass pane and a knotted curtain. The photo was taken at the end of March. On May 8, I immediately recognized the home in a news report of a kitchen fire which caused extensive damage to the home's interior. Thankfully, nobody was hurt. 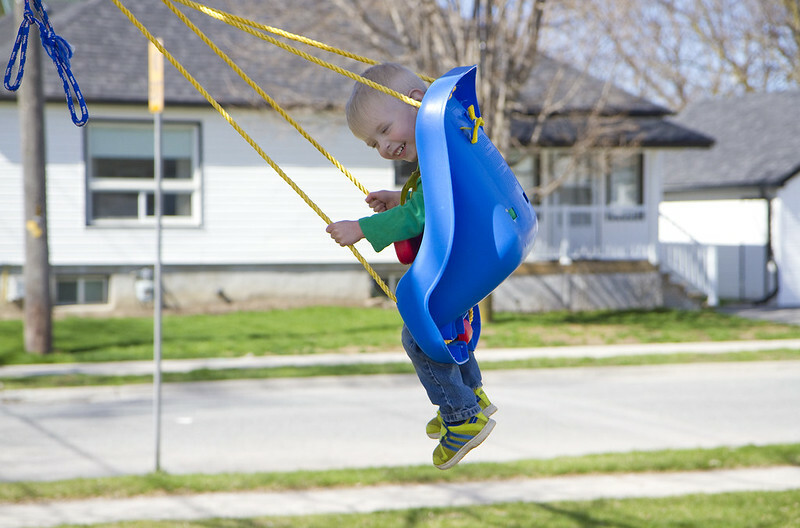 Oblivious to troubles in the world, this little guy was having the time of his life swinging from a tree branch while his Dad watched over him and helped him along with a hefty push. 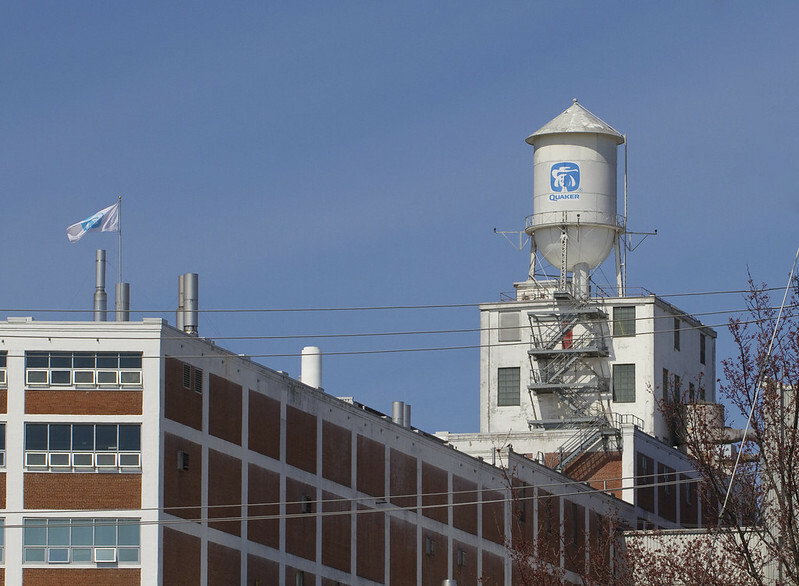 A Peterborough landmark, Quaker Oats first began operating here in 1902 but suffered a major fire just fourteen years later. In 1920, it was fully rebuilt into the structure you see in this photo. If the wind is blowing the right (or wrong) way, you can smell the sickly sweetness of flavoured oatmeal wafting over the east end of the city. 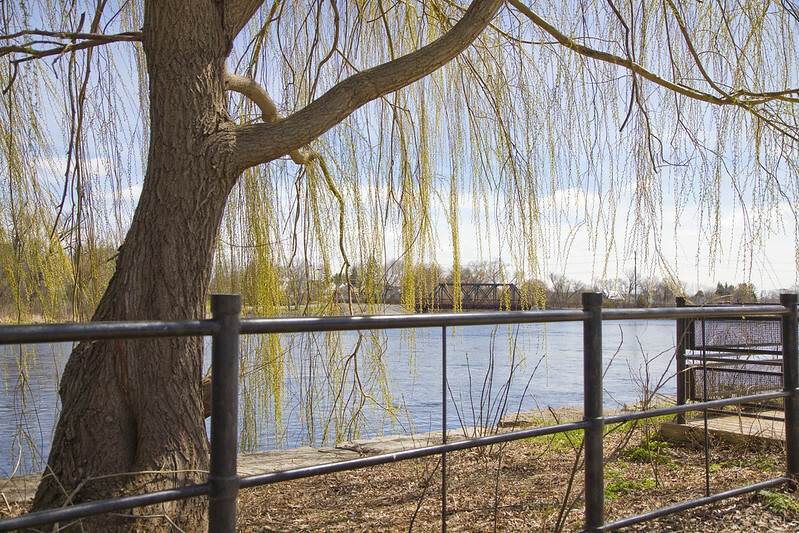 The catkins were just emerging on the weeping willow at the large lakeside patio of The Silver Bean in town. The café offers meals, snacks and drinks to enjoy out on their patio or dock. They're closed all winter but have just opened up for the season. In the distance, you can see the foot and train bridge which connects the west and east shores of Little Lake. 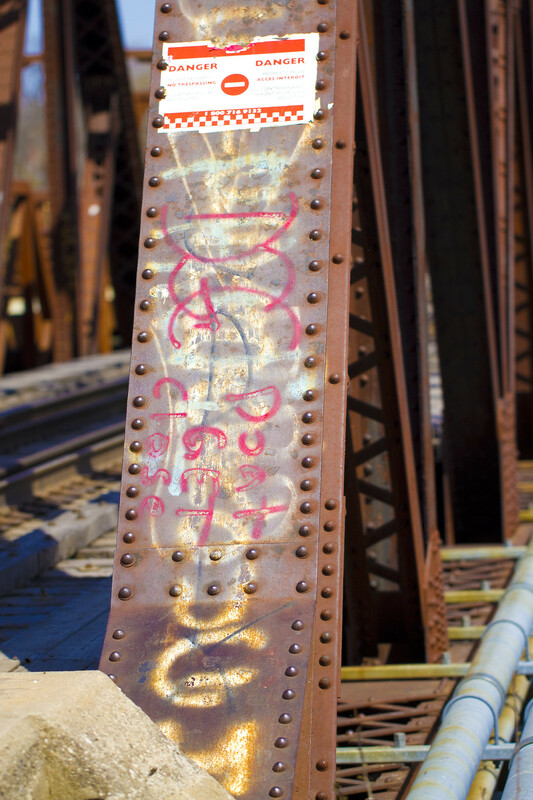 Here's a closeup of one of the beams on that bridge as it sports some of its ever-changing graffiti. This sculpture which is situated in Millennium Park is called Esker. Depending on whose article you might read, it depicts 1) a mama wolf and her cub, 2) a sled guide dog staring down a wolf or 3) a regular canine puppy and its mother. The artists are Maryann Barkhouse and Michael Belmore and I'd assume they know the truth. 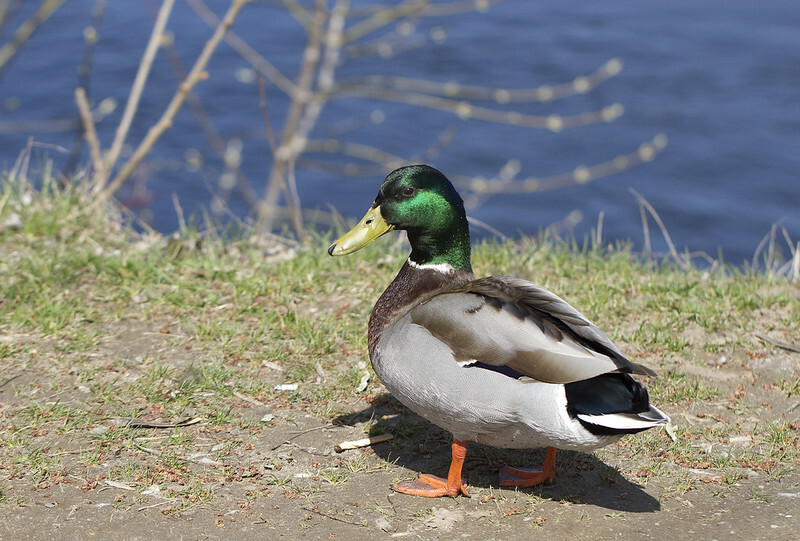 Back in 2013, vandals did damage to the smaller figure when they removed it and threw it into the lake. 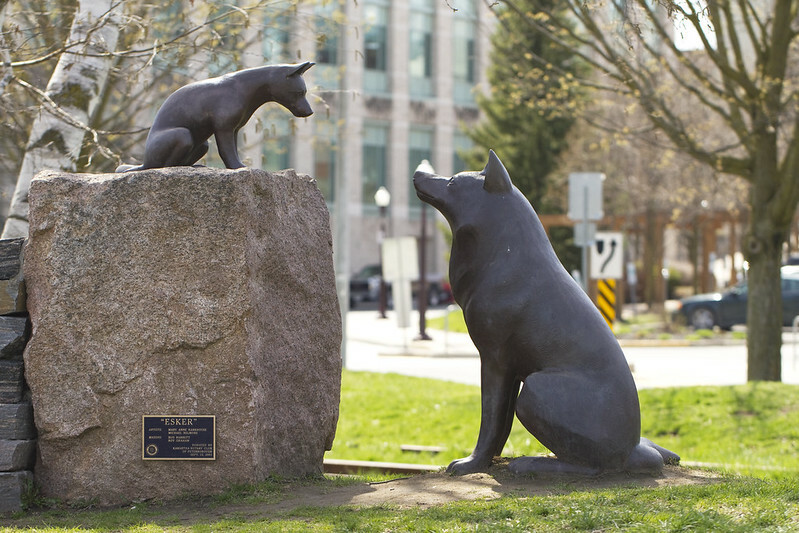 The artists restored their work, and the pair of pooches were soon happily reunited. 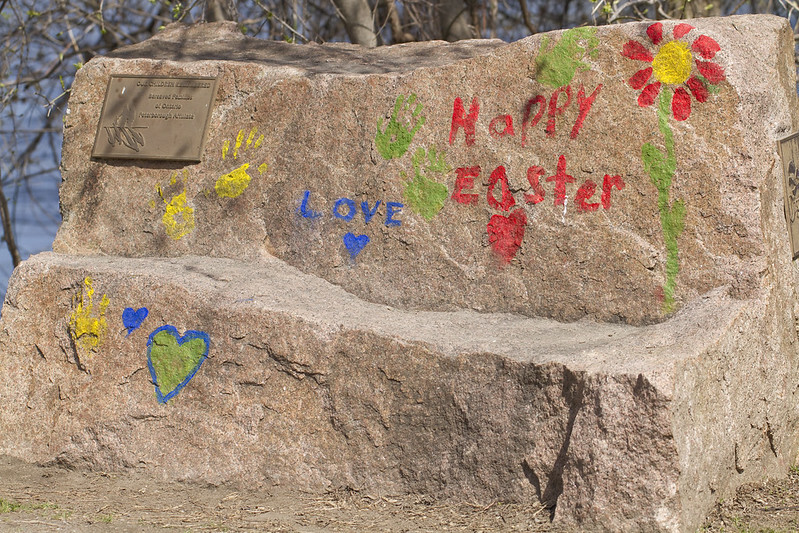 This boulder is located near the Butterfly Garden - a children's memorial put in place by The Bereaved Parents of Ontario. 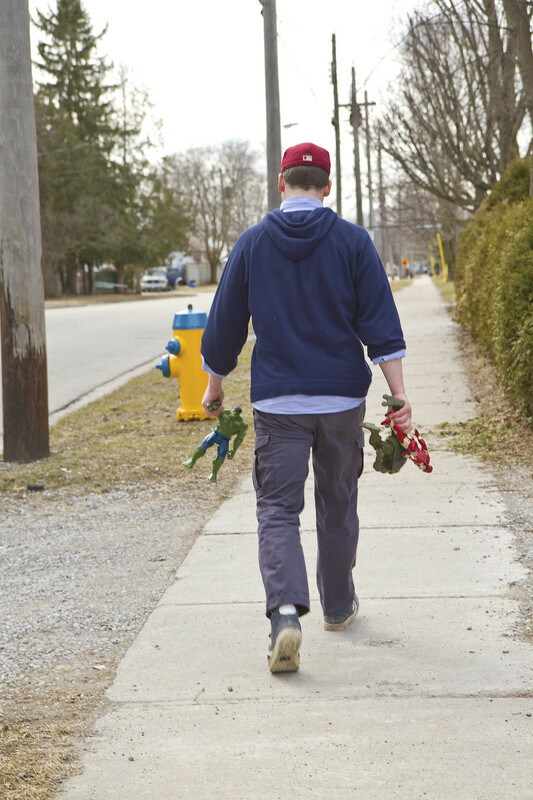 Easter had arrived and these colourful offering were left by grieving parents. 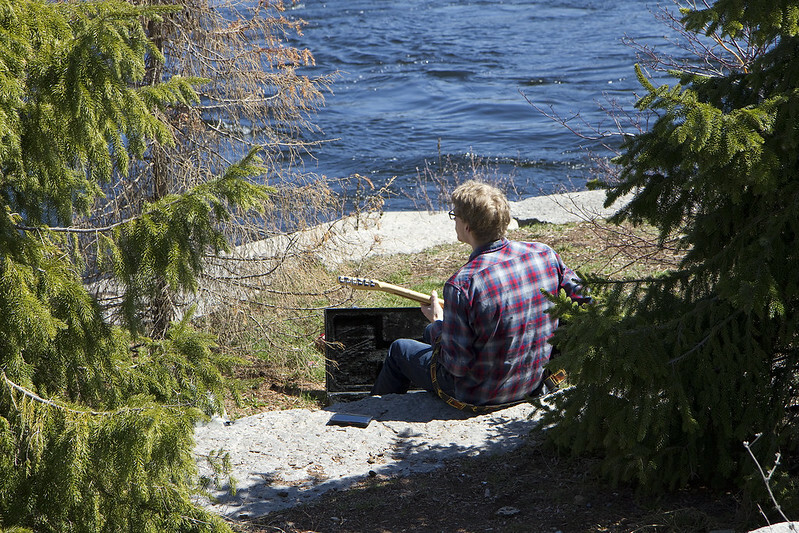 Sitting on the rocks, by the swift waters of Little Lake, this lone guitarist was enjoying his music. Have a quick listen to the guitar and the water. 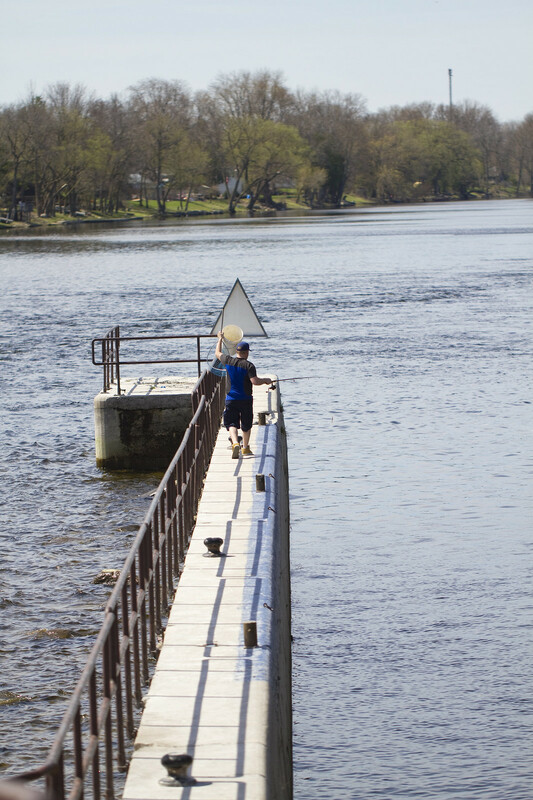 I chatted with a young woman while we watched her brother head off along the walkway at the nearby lock. 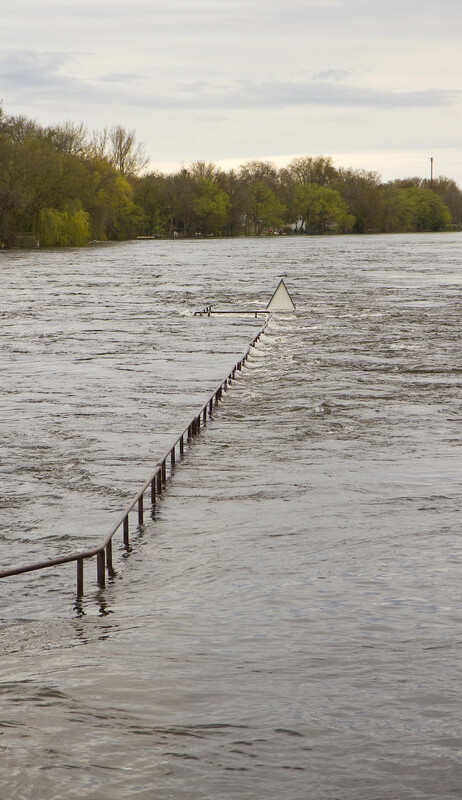 With the excessive rain which followed for days afterward, the walkway has now become completely submerged by the swift river current. Only the very top of the rail is now visible. 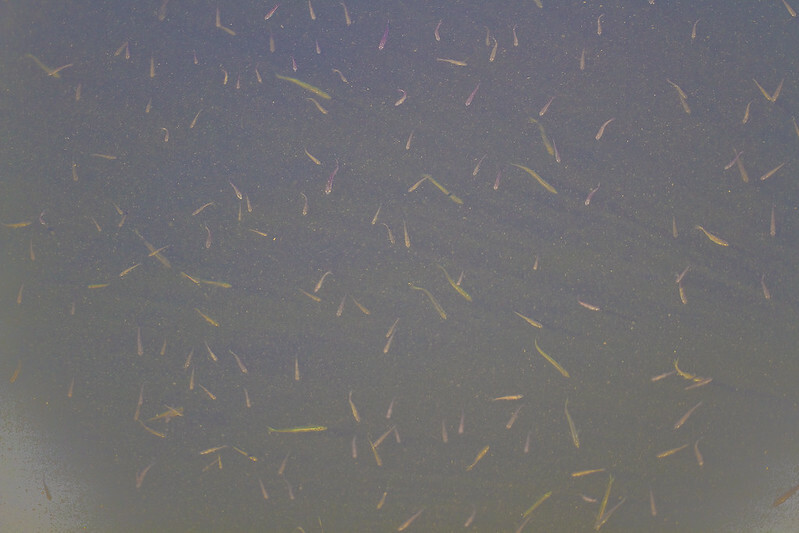 Thousands of little minnows were dancing and darting in the water below. This is the last we'll see of those tree roots for a while. 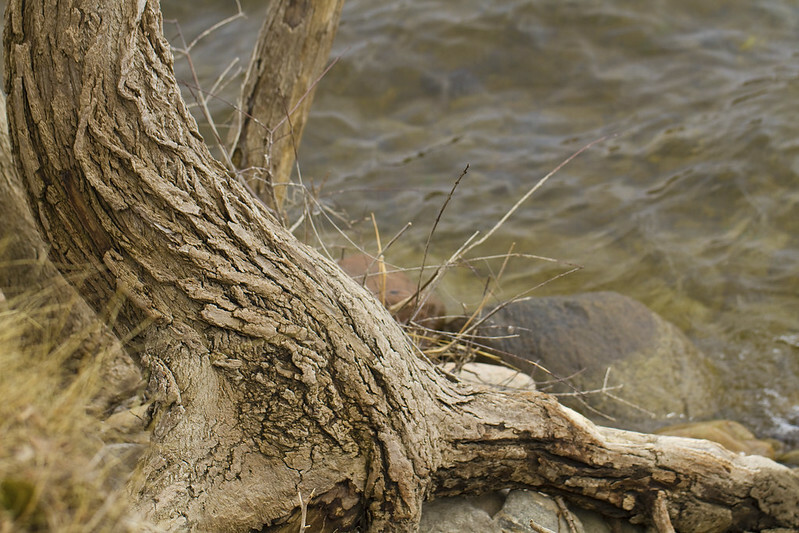 The bottom three feet (at least) of its trunk are now under several feet of water. On my way back home, I found myself amused by the collection of toys in this young man's hands. Perhaps they were inadvertently left behind by a younger boy's hands. Springtime - when everything awakens after a long winter's sleep. A couple of weeks back, I took advantage of the warm weather by heading out to walk whenever I could. All sorts of creatures had the same idea. 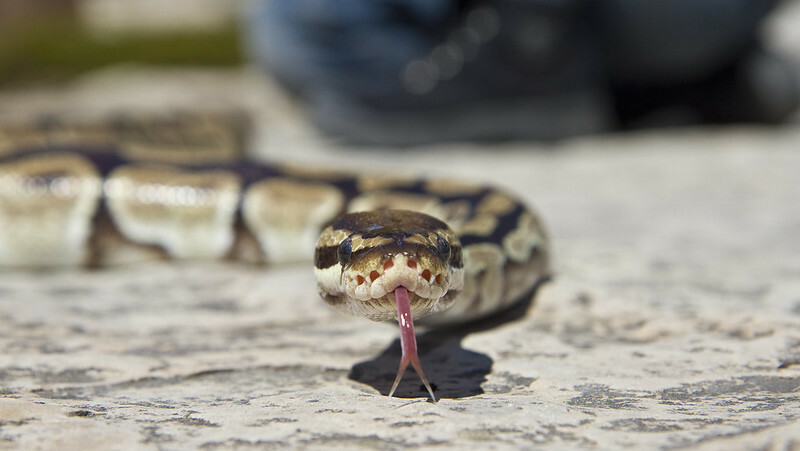 One day, early last summer, I ran into a man who was allowing his pair of pet snakes to sun themselves on the rocks. 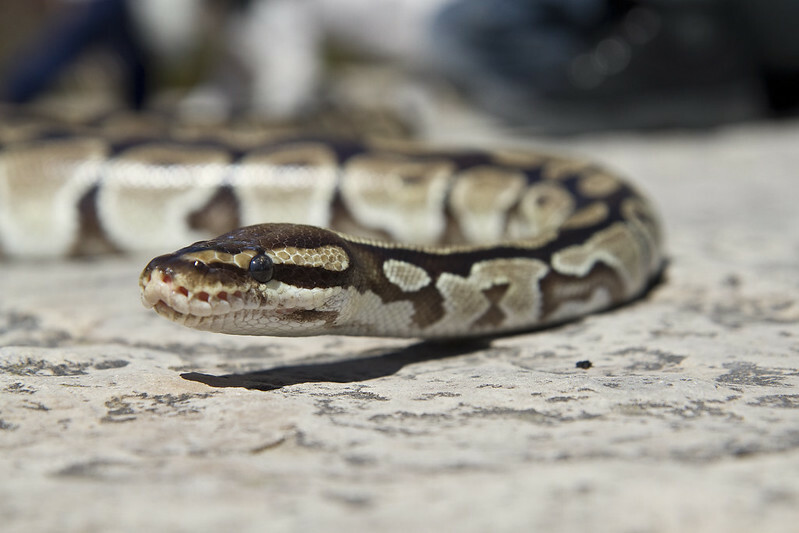 Well, I encountered him again this year, and he had one of his Ball Pythons with him. Kids kept stopping by to get a closer look. Some opted to try him on for size. 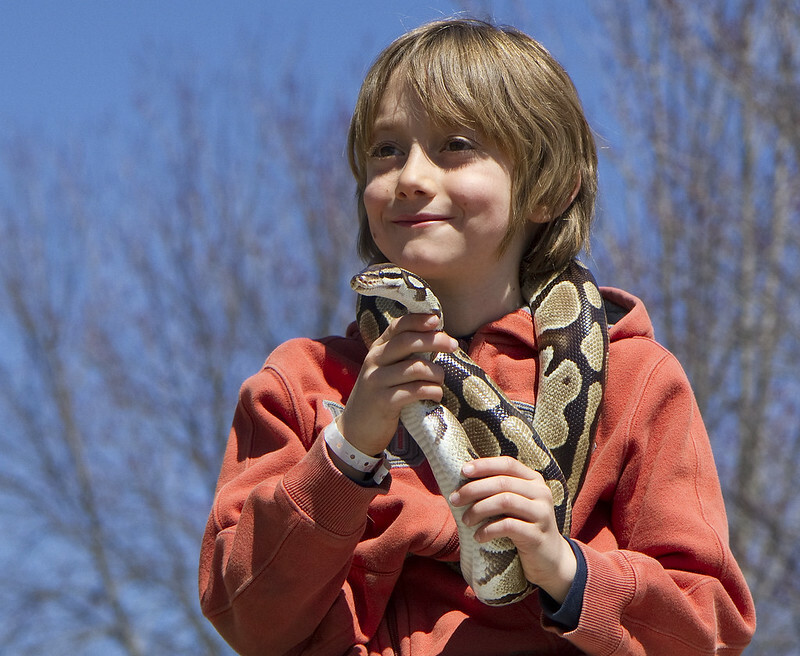 This little cutie was proudly showing off his new friend to his dad. 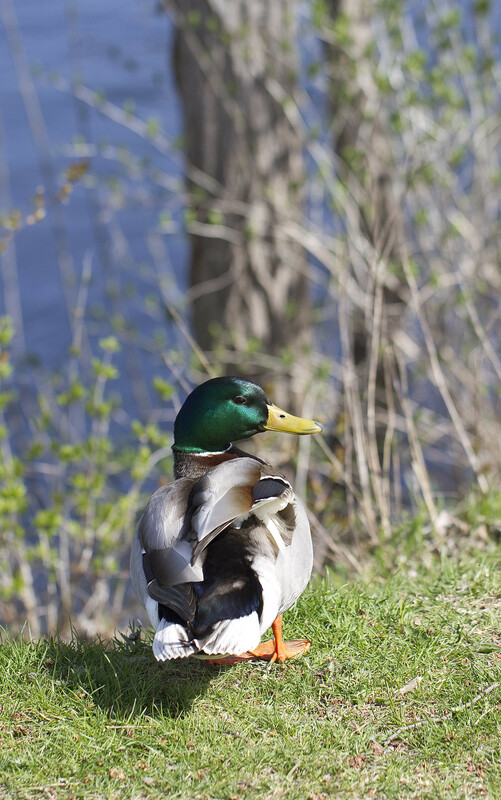 The ducks are enjoying the new growths of spring. It looks as if this guy just quit smoking. 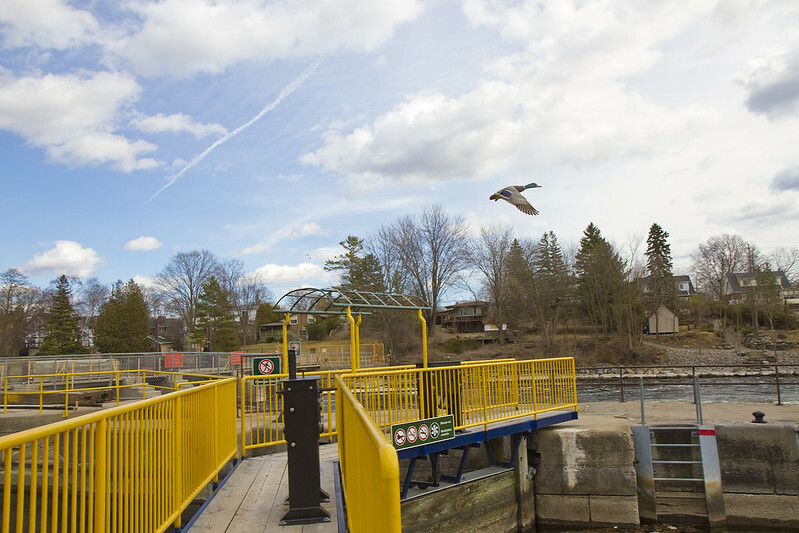 This mallard is sailing free over Lock 19. 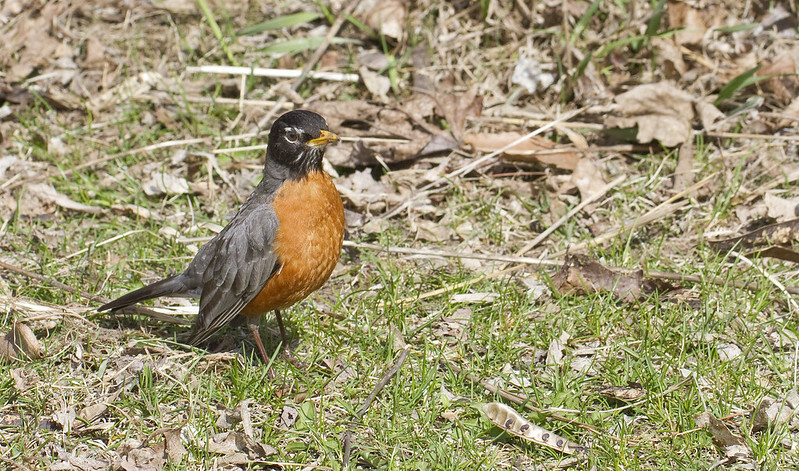 Robins have been back in the area for quite a while now, but this is the first one who has held still long enough for me to photograph it. Thanks, little one. A starling has found a nice little glass house in which to build her nest. 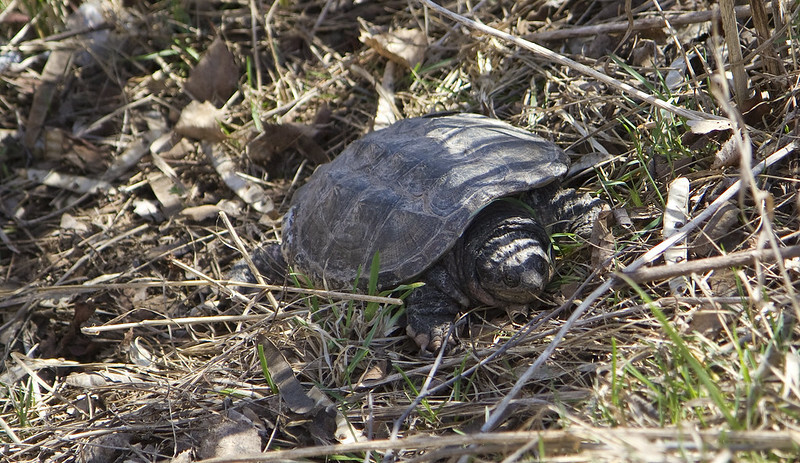 A rather small snapping turtle was keeping her eye on things while hanging out near the water's edge. I wondered if she was laying eggs or just having a relaxing moment. 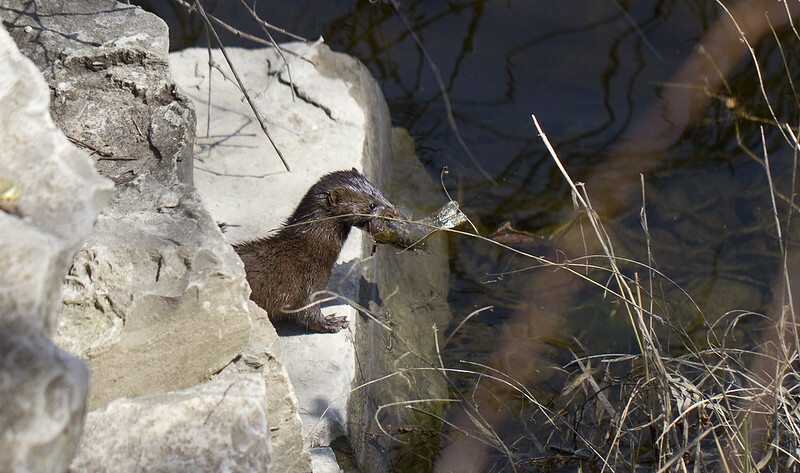 It was a treat to see this little mink pop up on the rocks with its catch. She watched me for a few seconds then disappeared back into the water with her meal. My neighbour's cat often hangs around my place. He thinks my door is an extension of his own place and just steps right in when he gets the opportunity. 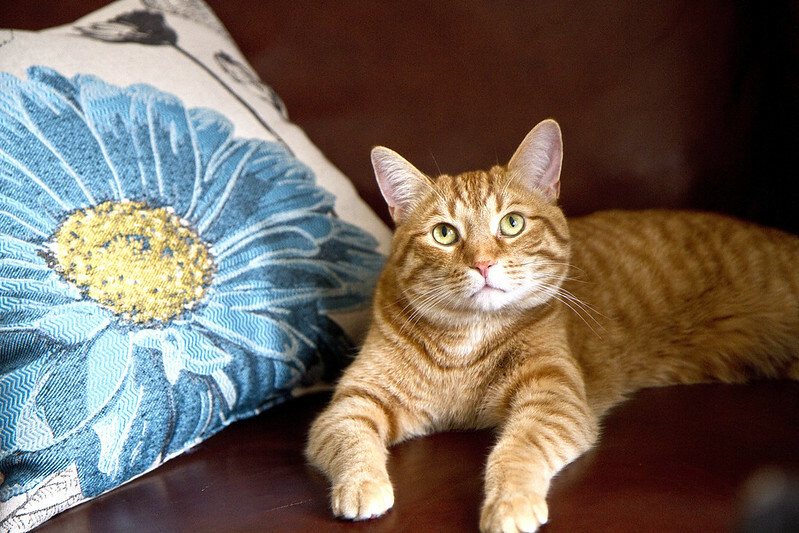 Make yourself at home, Oliver. That's it for today. More photos coming up whenever I get around to them - which is not so often, these days. Thanks for sticking by.